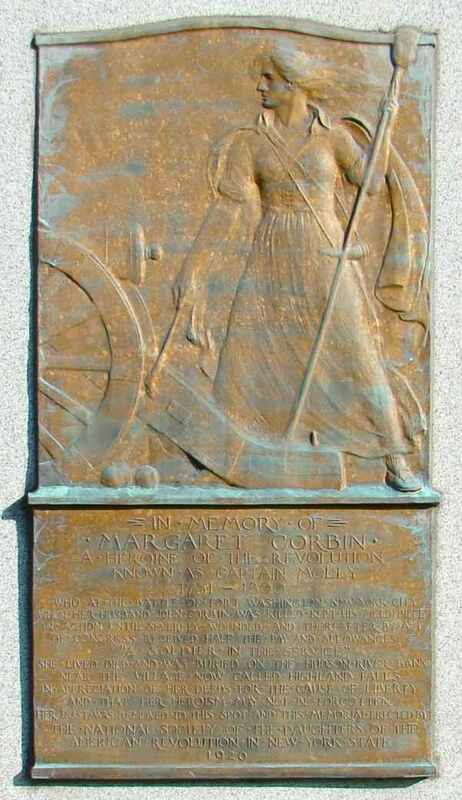 On this day in history, July 6, 1779, Margaret Cochran Corbin is the first woman to receive a military pension from the US government. Margaret Cochran was born in 1751 in Pennsylvania. When Margaret was only 5, her father was killed in an Indian attack and her mother was kidnapped, never to be seen again. Margaret and her brother happened to be visiting their uncle on the day of the raid, so they were not killed. The two children were then raised by their uncle. In 1772, Margaret married John Corbin who joined the First Company of the Pennsylvania Artillery when the American Revolution began. Rather than stay at home, Margaret became a “camp follower,” which were women who traveled with the army and provided services such as laundering clothes, cooking foods and caring for the wounded. 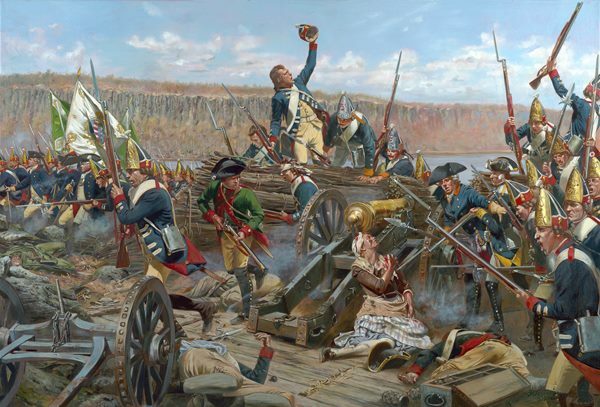 By November of 1776, John's unit was stationed at Fort Washington in northern Manhattan. This was the last American stronghold on Manhattan Island and it became a target for the British to control the entire island. 3,000 Americans defended the fort, while 8,000 British and Hessian soldiers attacked. Versions of Margaret's story differ according to the source, but generally the story goes like this: John Corbin was loading a cannon, while another man would fire it. Margaret was there assisting John as he loaded the cannon. When the man firing the cannon was killed, John took his place doing the firing, while Margaret took John's place loading the cannon. Eventually John was killed as well and Margaret took his position firing the cannon. Margaret's shots were so accurate that the Hessian attackers began firing on her position. She was eventually shot several times. Her jaw and chest were damaged and her left arm was nearly cut off. After the British stormed the fort (winning the battle), Margaret was paroled with the other soldiers. She was then taken to a military hospital in Philadelphia, but she never fully recovered from her wounds. In fact, she never regained the use of her left arm. Margaret's story quickly gained legendary status. Upon hearing of Margaret's sacrifice, the Philadelphia Society of Women began making plans to erect a monument in her behalf, but when they met her in person, they changed their minds. It seems that Margaret was quite rough. She was a smoker and a drinker and was said to be gruff and "unclean." Because of her injuries, Margaret was unable to care for herself and had trouble finding employment. The government of Pennsylvania gave her $30 in June, 1776, to help her with immediate expenses. Then they referred her to the Continental Congress, which agreed to give her half of a man's military pension for the rest of her life on July 6, 1779. Margaret was then enrolled in the Corps of Invalids, a special unit for injured soldiers located at West Point, where she lived for the rest of the war. Through the efforts of General Henry Knox, Margaret was placed with a caregiver in later years in Buttermilk Falls (now Highland Falls) near West Point. Margaret was buried in a non-descript grave near here upon her death in 1800. In 1926, Margaret's grave was rediscovered and her remains were moved to West Point, one of only two Revolutionary War soldiers to be buried at the United States Military Academy. Her remains were identified by comparing the wounds on the skeleton to the description of her wounds received at the Battle of Fort Washington.